Boilies are hard-boiled baits that were originally introduced to carp angling in the UK during the late Seventies with the sole purpose of keeping 'nuisance' fish from eating away the bait being presented to the Carp… though there were a few forward-thinking anglers back in the sixties that began to experiment with different paste type baits and boiling the ingredients to make them hard. The baits or ‘boilies’ as they were later to become known were very simple baits originally made from eggs and whole-wheat flour or semolina with some flavoring thrown in for good measure. These baits were rolled into various size balls and then boiled for a while to form a tough skin on the outside of the bait. Carp anglers started catching larger fish on these baits and the word soon began to spread throughout the carp angling community. In the late seventies/early eighties additional ingredients were added such as sweeteners and preservatives, these baits then started to be manufactured commercially. Both fishery owners and anglers alike found that their catch rate of larger fish seemed to increase. It was also noticed that the fish were gaining weight at a far greater rate than before the introduction of these new baits. The original Richworth ‘Tutti-Frutti’ was a boilie that caught the UK's attention by storm; with many fish falling to this new ‘wonder bait’… Imitators soon followed and the great bait race, was well and truly on. There have been many theories over the years regarding boilies, their use, nutritional value and importance to the carp angler’s toolbox. There’s no doubt about it though…. the right boilies do seem to separate the bigger fish and have accounted for many PB (Personal best) Carp for anglers both sides of the Atlantic. We have been fortunate enough to have experienced this first hand. If you’ve never fished with boilies before it can be a life changing event when you see the difference! There is an almost overwhelming choice of boilies to choose from these days so which is the best for your situation…? Ready-made, Freshly rolled, 50/50 mix, Fishmeal, Bird food, Protein HNV (High Nutritional Value)… the list goes on and in answer to the question ‘Which is the best for you?….' it would all depend upon the situation that you are fishing. These types of baits are aptly named, they are designed to catch fish very quickly and need little ‘introduction’ to a water to achieve results. They are the so called ‘Instant Baits’. Usually highly flavored and often brightly colored. They will catch carp quickly if they are of a high quality (don’t be fooled into thinking that just because a bait is brightly colored and has a great deal of flavor that they will catch fish consistently. A popular and very successful approach for Winter sessions when the fish aren't moving very far searching for food and will not be eating much food anyways due to the low metabolism in the colder water. Traditionally these baits had very little nutritional benefit to the fish were often ‘fruity’ flavored and would ‘work’ for only a very short time. However, the ‘New Age’ of ‘readymade’ attractor type baits introduced in the late 90’s really dispels this old cliché with baits from many of the companies mentioned above that catch fish consistently with a higher quality of ingredients than were previously used… and will also continue to catch over a period of time. The ingredients used are usually of extremely high quality with the sole purpose of designing a bait that will be looked upon by the fish as a valuable food source. They are a ‘long-term’ bait approach. A good analogy is that they could be viewed as the equivalent of a ‘well balanced meal’ for a human being. Not something that you might go crazy over like a piece of chocolate but something that you would eat every day for the rest of your life that contains an excellent source of protein, carbohydrates, fiber, vitamins, minerals, amino acids along with some digestive enzymes all in one food source. 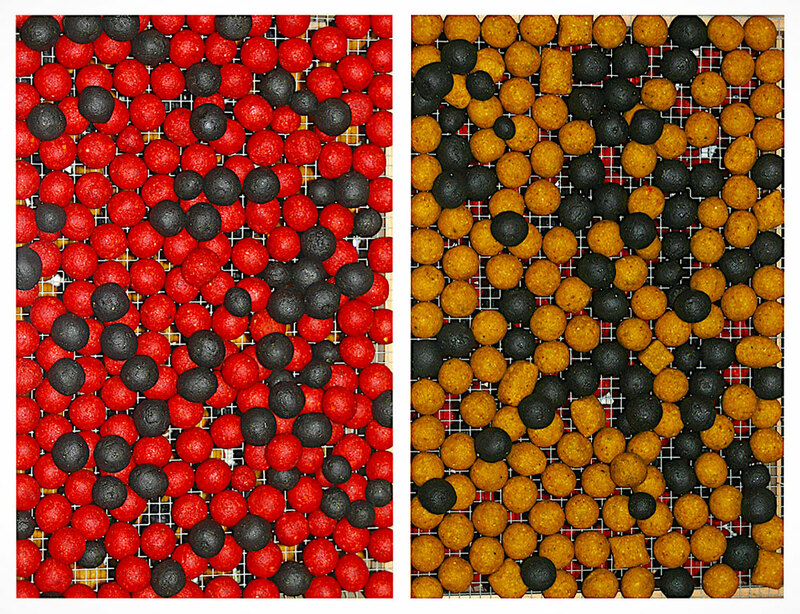 They are not necessarily bright in color, or contain high levels of artificial flavoring… it is generally agreed upon that over the long term ‘food source’ type baits were not only better for the wellbeing of the fish but would also catch the larger fish more consistently, especially on a longer session of say a week or so when the initial ‘attraction’ of the ‘attractor’ bait had worn off. The theory is that the fish will consistently look to the food source bait as a valuable means of nutrition and therefore continue to eat the bait knowing that it is good for them. Many bait companies are now producing extremely high quality baits that have bridged the gap between the two types of traditional boilie as described above. Boilies are a devastating bait when applied correctly to a given angling situation and have likely accounted for more PB’s than any other bait since their introduction. Many anglers make their own boiled baits and there is indeed a great deal of satisfaction on catching a fish with a bait that you have made yourself. Making your own boilies can be quite a time intensive task which has both its good and bad points which we intend to cover in detail elsewhere on this website a little later... However, there is no doubt about it, freshly rolled baits made with high enough quality of ingredients generally give you better results than 'shelf life' boilies. The slight disadvantage is in the fact that they do not keep well because they don't traditionally have preservatives added to them. The limited shelf life of a freshly rolled boilie can be prolonged significantly by either air-drying them, which will harden them considerably or by freezing them in vacuum bags. The above photo trays of Home Made Boilies at the American Carp Society's Offices. So what boilie is the best for your situation? Is there a difference between a high quality ‘food source’ type bait and ‘attractor’ bait loaded with color and flavors and the correlation between catch rates with both? There are some excellent ‘attractor’ style boilies on the market as well as the more traditional ‘food source’ style and both catch fish well. However, it’s worth looking at the both the long-term catching abilities of the different styles of boilie as well as the long-term nutritional benefit to the fish. The two are not necessarily linked. There is another side to this equation that we must consider as responsible stewards of the sport. Let’s face it, a carp will pick up a piece of plastic imitation maize and get caught… but this is not something that will aid the fish in its long term dietary needs, so there is something to be said for the ‘other side’ of the equation also. .
Carp have no stomachs and their food is digested in the intestinal tract… therefore the higher the nutritional value of the food-source in its intestinal tract the more benefit the carp will get from eating the said food source… if they are filling up with non-nutritious ‘food’ they may not be healthy and gain weight etc. So attractor type baits may catch Carp for the short term but eventually they may not look to the bait as something that is ‘good for them’ to eat… this is the reason why high attractor style baits work for a shorter period of time than a higher quality bait. But as mentioned above there is now a new breed of baits containing high quality ingredients that catch fish well and consistently over a long period. It is worth experimenting with, but you will hear from other anglers of certain baits that are working well on certain venues, it may have something to do with a color boilie, flavoring or the fact that anglers have been using that bait at said venue for a period of time and it is of a high enough quality for the fish to view it as a legitimate food-source. There are some fantastic boilies being made commercially these days… given the right situation we have seen them out-fish every other bait known to man! There are lots of bait companies that sell bait… and now there are those based right here in the USA that are making bait for Carp Anglers… its always wise to speak to other anglers and check out the forums to see what is working for them… but whichever route you decide to take, whether ‘rolling your own’ or purchasing from a commercial company… with a little hard work, time and patience put into introducing your Carp to this type of bait, the boilie can be even more effective than a single grain of corn if used correctly and has a permanent place in the Carp Anglers bait box. It all has its place.